A trigger folder is simply a Windows folder that Easy2Sync watches for changes. 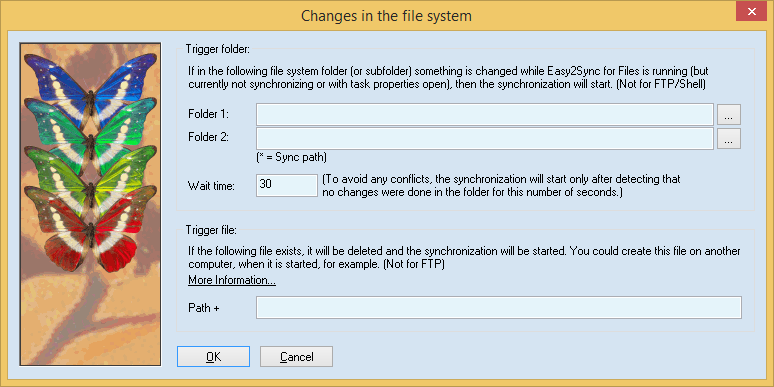 if any file is changed by any application, a sync can be started. The folders that are being watches (up to 2) can be identical with the synchronized folders, but don't need to be. If you want to watch the synchronized folders, you can simply enter an asterisk ("*") as path. Some NAS devices have a bug regarding this function. They correctly report a change in the trigger folder to Easy2Sync, but they do not notify Easy2Sync for changes in subfolders. This is not Easy2Sync's fault, only the manufacturer of the NAS can fix this bug.